Students from the Moencopi Day School create some of the recipes they learned. Wendi Lewis is the Project Manager for Moenkopi Developers Corporation, Inc., and a Hopi tribal member. You can hear in her voice the commitment she has toward providing much-needed support to her community. She served as the Project Manager for the “Take and Make Healthy Foods Project” supported by First Nations Development Institute (First Nations) under its “Nourishing Native Children: Feeding Our Future” Project that was generously supported by the Walmart Foundation. “One of the biggest highlights was that the response was great from the parents, and one of the things they were happy about was that we met all of the numbers, goals for our project. I don’t know how else to say it – but the kids created excitement (about the project),” said Lewis. 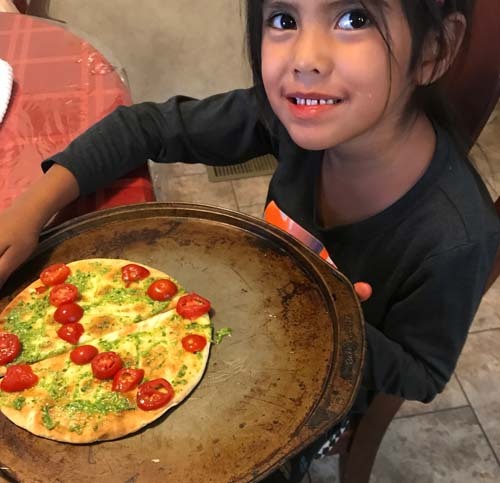 The “Nourishing Native Children: Feeding Our Future” Project provided grants to Native American communities to continue or expand nutrition resources for existing programs that serve American Indian children ages 6-14. The project’s goals were to support Native American community-based feeding programs, and to learn from these programs and other model programs about best practices, challenges, barriers to success, and systemic and policy issues affecting Native children’s hunger, and to foster partnerships among programs. 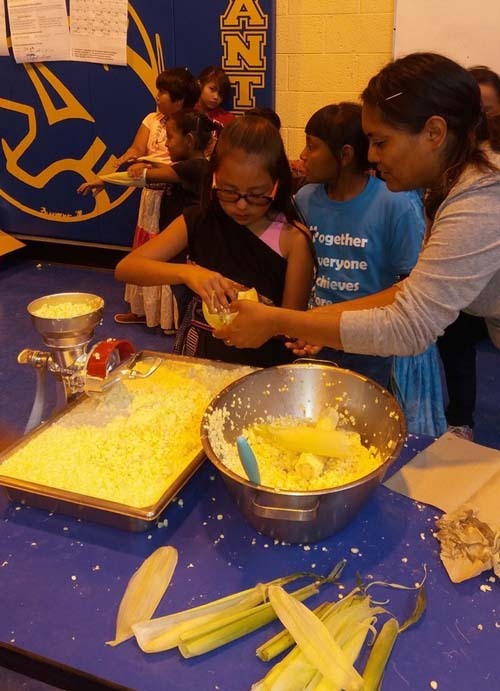 The Moenkopi Developers Corporation was awarded funding to further its “Take and Make Healthy Foods Project” that provided 168 students from the Moencopi Day School with take-home packages, twice a week, containing ready-to-make foods to prepare with their families. Each pack had minimum of one local traditional or student-grown ingredient. Students learned how to prepare each snack and about the related health benefits during weekly greenhouse classes, which included garden and nutrition educational information. Also, 11 Take and Make bulk ingredient bags were distributed as well. The project was supported by First Nations and the Walmart Foundation from July 2017 to December 2017. Lewis said that despite the challenge of not being able to grow all of the ingredients in the Moencopi Day School greenhouse, they were able to purchase foods from a local organic grower. They also received donations from local farmers and one who had a surplus of apples. They picked the apples straight from the orchard and incorporated them into the education curriculum during the greenhouse classes. The students learned about how to grow food in the greenhouse and what to do when there is a surplus of an ingredient, such as basil. “We were able to do a pesto tasting since we grew so much basil and lettuce. They (the students) did a taste testing with the entire school. For the salad recipes, we grew lettuce and it led to the salad bar being a goal they are working toward for upcoming academic year, with ingredients to come from the school greenhouse and garden,” said Lewis. Another goal of the project was to incorporate traditional foods into the recipes in the Take and Make Healthy Food packs. Some of the recipe ingredients were grown by the students in the greenhouse classes at the school, or they were locally grown in the area, on Hopi land. Students from the Moencopi Day School receive food ingredients for recipes as part of the Take and Make Healthy Food packs and “Nourishing Native Children: Feeding Our Future” Project. Trinity Honahnie is the Parent Liaison with the Moencopi Day School, and a Hopi tribal member. She worked along with Curt Cebula, the school’s Food Corps member, and Mardell Humetewa, who is a regular volunteer and tribal community member, to prepare and package the Take and Make food packs. Honahnie said they offered traditional foods in the beginning of the program when the traditional foods were more readily available. “The Hopi people are farmers and they like blue corn for flour – so the community can make piki, which is our traditional paper bread. It’s crusty and rolled up like a burrito. Also, dried peaches and apricots, and there were two traditional Hopi spices that Wendi included in one or two recipes. Those spices are pretty hard to come by – and she got enough for 168 students,” said Honahnie. Some of the traditional recipes in the Take and Make meals included baked blue eggs (SawkaNgöhu) and Tu’itsma, Sipalkwivi and Piki/Piklaq’kutuki, blue corn pancakes that featured locally-grown ingredients, and three-bean salad. “It was surprising how many students had never tried some of the traditional foods before. Living here, it doesn’t mean everyone can farm or attend to crops. We’ve become accustomed and used to modern food. A few grandparents, who are raising their grandchildren, were excited. One grandmother said she never thought to make that (the traditional foods) for the kids. She had never made it because she didn’t think they’d like it. Now the kids are like ‘can we make this again’ and they enjoyed it. She was shocked that they were into the traditional foods,” said Honahnie. Language and culture were also incorporated into the program. In the Hopi culture class, the students learned the traditional Hopi names for the ingredients being used and how to say “to stir” in Hopi. The students would go over the words in Hopi and English so the students would gain an understanding of how the words and actions go together. “We have a lot of famers who plant traditional – certain crops – and they sometimes get an excess of melons, beans, etc. The goal of teaching them (the students) how to use the traditional crops in different ways is good. It’s keeping up the traditional ways in a different way, and the big goal is about nutritious foods. We got a good response and we hope it can change habits of some of the parents, too. Even with the traditional foods, we’re used to boiling the beans and eating it, that’s what were used to. But beans can also be used to make dip, and then there’s watermelon for watermelon salad,” said Lewis. Feedback from a parent about the project. 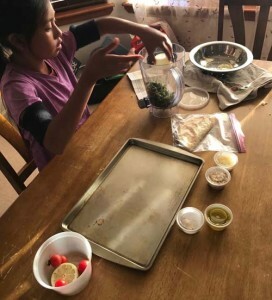 Information about what Moencopi Day School is doing with its greenhouse and with the “Take and Make Healthy Foods Project” is being shared with other schools on the Hopi reservation. Many want to implement such a program in their schools to encourage the conversations around how to change eating habits for better health. Trinity Honahnie sees the impact the program has had on her community.